A Mother's Lesson in Mercy! Today, our Lord taught me a very important lesson about mercy. 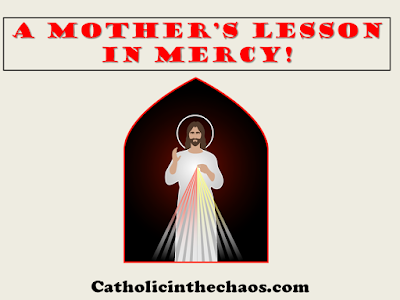 I've been devoted to the Divine Mercy Chaplet and Novena for many years now and I "know" (meaning I recognize with my thinking but not always truly feel or understand) that Jesus is there simply waiting to dole out His mercy upon us if we just ask. 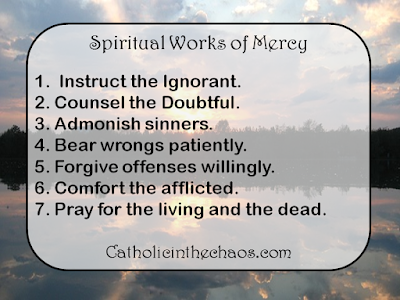 Oh, but how easy it is to forget the second step in the "mercy process". In the Our Father we are reminded "Forgive us our trespasses AS WE FORGIVE THOSE who tresspass against us." At the end of the Divine Mercy Chaplet there is a beautiful prayer that states: "Eternal God, in whom mercy is endless and the treasury of compassion inexhaustible, look kindly upon us and increase your mercy toward us so that in difficult moments we will not despair nor become despondent but with great confidence submit ourselves to your holy will, which is love and mercy itself." Yes we are most definitely expected to participate fully in step two, sharing that mercy with others. You may be asking yourself, "Ok so what does all that have to do with the lesson you learned today, Maria?". Well, sometimes I forget that the people who need my love and mercy the most are the ones who are the closest to me, my family. This week has been a rough "listening week", to say the least, for my oldest, Pickle. Let's just say, this week he has been really showing his independent thinking by trying to respond to my directions with his own actions. The problem with this is that many times five year old thinking does not take into account consequences and safety the way a parent's mind does. Yet it is through this very struggle that we both learned a priceless lesson. Today, Pickle was playing with his younger brother, little Bean, when he decided it was a good idea to run around the kitchen pushing Bean's walker and slamming it in the walls. I told Pickle several times to stop doing this as he was going to hurt himself or Bean. Sometimes, I guess lessons are learned best through experience. Within seconds of my third explanation (like a good mother, providing rationale and reason for the what's and why's of my directives), I hear a great BANG and Pickle immediately begins to scream and cry "I broke the walker!". I turned around and all I see is blood everywhere! Pickle was in shock that he broke his brother's toy that he hadn't even noticed he was hurt. Sidenote: Anyone who knows me, knows I am NOT good in emergency situations. I tend to freeze completely or scream when I see the sight of blood. But something happened inside of me in that moment. I was absolutely calm. It was as if I was moving in slow motion and my thoughts became crystal clear: 1) find the source of the bleeding, 2) stop the bleeding, 3) determine the severity of the injury, 4) remain calm so Pickle can calm down as well. I KNOW?! This is definitely not me. It was as if I was a different person, someone possessed, going through these motions only through the grace of God, I can assure you! Quickly, I took Pickle's hand, sat him on the kitchen counter next to the sink, grabbed a handful of wet paper towels and dabbed the blood away. It continued to gush down his throat, in his mouth, all over his teeth, I just couldn't figure out where it was coming from. Finally, I was able to stop the bleeding long enough to see there were three sources from which it was comine, his top lip was split, his chin was scratched several times, and underneath his chin there was a deeper cut where most of the blood was gushing forth. Within a few minutes the bleeding was stopped and I was able to really assess Pickle. He was scared but he was just fine (Thank you Pickle's Guardian Angel!). Nothing a little cold compress and a few band-aids couldn't fix. Little Bean was just fine too (Thank you Bean's Guardian Angel!). Yet, Pickle could not calm down. He was so devastated the he broke his brother's toy he couldn't stop crying or breathe. This was the moment, I felt the Lord teaching me a lesson. As much as I wanted to yell and scream that I am so tired of telling you to follow my directions the first time they are given and this is what you get when you don't listen to mom and so on and so forth, it was like the Holy Spirit spoke to me. In that moment, only one word came to my mind "mercy, mercy, mercy". This is what the Lord was asking of me. Have mercy on Pickle in this moment. He has learned his lesson the hard way. Now is not the time for a lecture but the time for mercy. The time to show my son that no toy is more valuable than the love I have for him and no action he could ever do, would diminish that love. With those words on my heart, I spent the next half hour loving him and explaining to him gently that no matter what choices he makes (good or bad) I will always love him, and just like Jesus forgives us for our mistakes, so I forgive him for his. Of course, once he realized he had to eventually tell Dad what happened after he gets home from work today, a new torrent of tears came streaming down his cheeks. Oh how I wished at that moment I could take away his anguish! I wanted desperately to offer to call my husband for him and to explain everything but again the Holy Spirit spoke "mercy" and I understood. As hard as it would be for me to see him worry about having to admit his mistake to his father, I also knew that it was something for which he MUST take responsibility. If I stepped in now, I would be doing him a greater disservice, and taking some of the real life-lesson out of this moment. I realized that sometimes, having mercy is consciously choosing to do the most difficult thing of all, watch your child struggle. This too is a great mercy as I am teaching my child that with every choice he makes there is a consequence, sometimes good, sometimes bad. With every consequence, he must take responsibility for those actions. What a hard lesson for a five year old to learn! But if not now, then when? And in what higher-stakes situation? Sometimes having mercy on our loved ones means we will have to watch them suffer for the sake of learning a bigger lesson. Sometimes, having mercy means we too will suffer with them. I think I may finally understand, on a very very small scale, how Jesus feels watching us make mistakes. 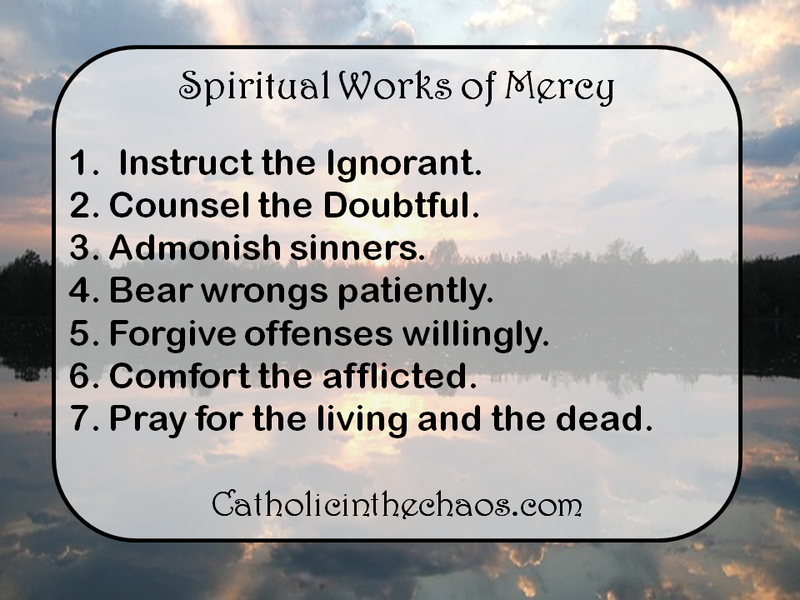 How He LONGS for us to make the right choice but how He knows the consequences of our actions will help us to learn the tough lessons of life and that maybe, just maybe He too suffers along with us all because He wishes to grant us the most wonderful gift of all...mercy! Blessing to you and your and may mercy be flowing from you today and everyday! I just finished reading this very quick booklet titled The Chapel Veil: Symbol of the Spouse of Christ, which consists of two short essays written by Elizabeth Black and Emily Sparks. I became interested in the theology behind "the veil" when I noticed a few women veiling at Mass. I have not been exposed to much veiling previously, so as an adult to see a re-emergence of "veiling" was quite intriguing to me. I, for reasons I can only attribute to the Holy Spirit, was drawn to these women and their exercise of veiling in Mass, however I had no understanding of the purpose or symbolism behind this tradition. I suspect most of us are familiar with the scriptural basis for this tradition explained by St. Paul in Corinthians however we lack a true understanding of the context in which this chapter was written. I have found a beautiful explanation here for this bible passage that makes much sense to me. Again, I suspect, most of us were told since veiling was no longer required under the 1983 Canon Law, it was no longer necessary or we were indoctrinated with a terrible falsehood, that veiling was an outward sign of subordination to man, which is FAR from the truth! Whether veiling be of necessity or not, I believe Mother Church, in her wisdom, provides each woman with the choice to decide this for herself. Yet, what I needed to understand was, what this veil tradition was all about? Why did it begin and why did the church require this tradition for 2000+ years before leaving it up to each woman to decide for herself? 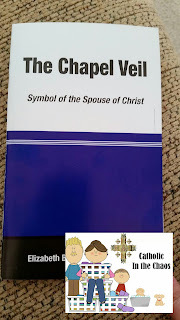 By divine grace, I somehow became acquainted with a woman who veiled and suggested I order this booklet to learn more about the theology behind veiling. Upon reading it, I have come to realize the true beauty behind this tradition. 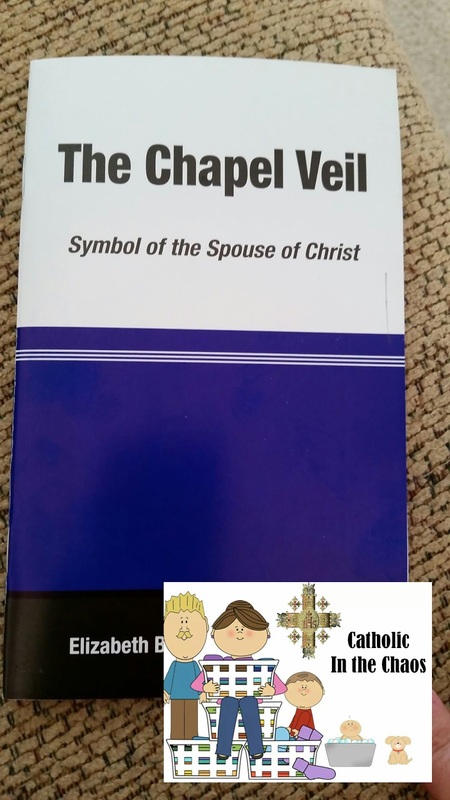 I recommend anyone who is interested in understanding the theology behind veiling, order this booklet and learn about this tradition for themselves. I cannot stress this enough, that the reasons for veiling has NOTHING to do with submission to man and EVERYTHING to do with honoring our Lord. 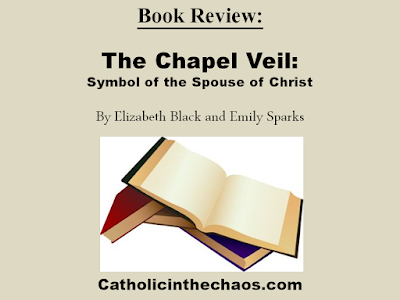 So if you feel so inclined, click on the link above and learn about the symbolic and theological reasons for veiling! This booklet is short, sweet, to the point and affordable. The essays are easy to read and comprehend. Within a few minutes, you will come to understand the reasons women all over the world continue to participate in this beautiful tradition! 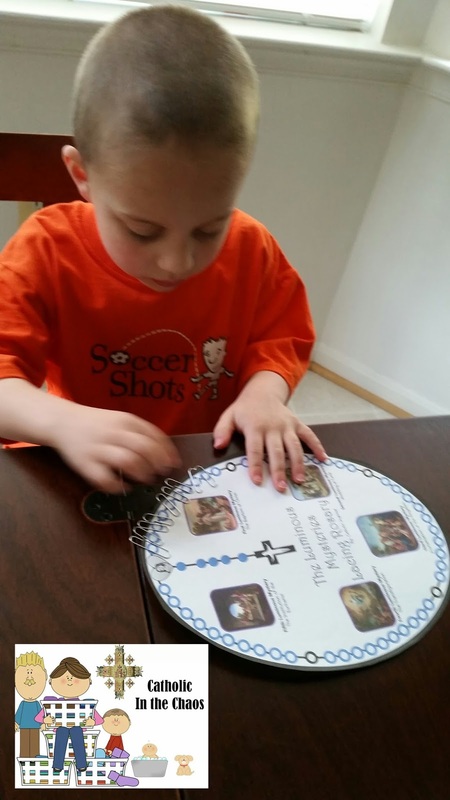 Getting Your Kids to Say the Rosary! Padre Pio said "The rosary is the weapon for these times". I believe this is true. Not only do I want my children to grow up loving our Blessed Mother but I want them to be prepared to face the evils of this world. And there are very real evils out there. If you have children like my Pickle than you are probably trying to figure out how to teach the rosary while keeping your child's attention. 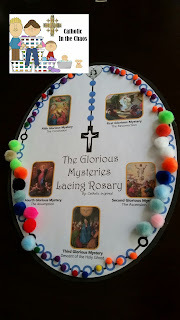 So I looked on the internet for some resources and found this super cute lacing rosary from Catholic Inspired (it's awesome!). But who ever said I had to use it just for lacing? 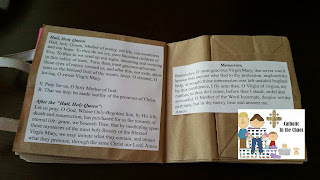 Here are few different ways we have used this rosary. 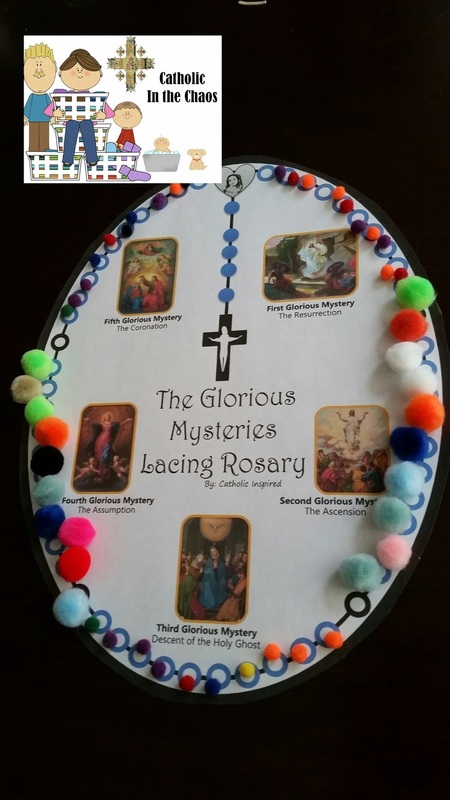 We've used pom poms to count the "Hail Mary" beads! We've also used paperclips as counters! Check out the finished product. Looks pretty good. I've even put these rosary papers inside a sheet protector and let Pickle use dry erase markers to color in each bead as he says it. But we couldn't just stick to one type of rosary as it could get pretty boring after a while. 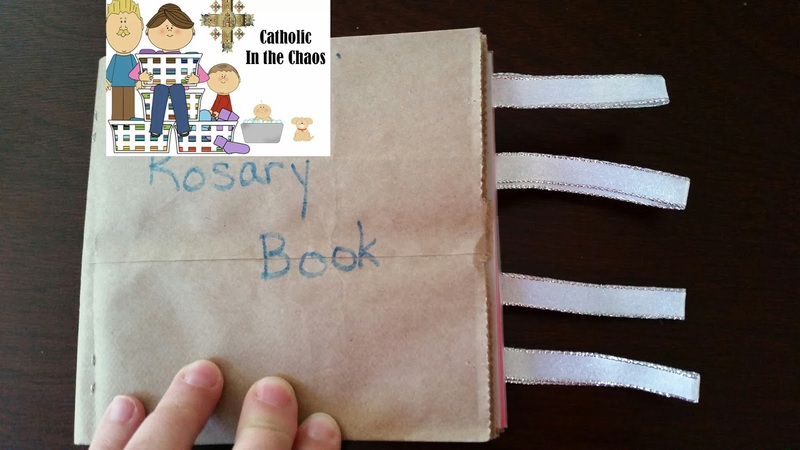 So the second rosary idea I saw on the net came from Catholic Icing's paper bag rosary booklets. I simply adapted it to fit Pickle's preferences and style. 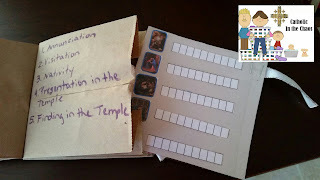 After grabbing some brown paper bags and stapling them together, I found a few sheets of card stock (the only colors I had left were pink and off white) that I used for the mysteries insert. 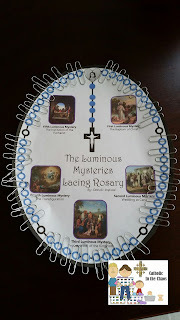 For each mystery picture I printed out an extra copy of the Catholic Inspired's lacing rosary (the 4 in 1) and cut out the pictures and glued them to the card stock. I know my son, and I know he needs to do something to mark off each "Hail Mary" he says or he struggles to pay attention. In addition, I notice if he isn't counting the beads he tends to think each decade is longer than they actually are and becomes discouraged. I then placed a simple strip of boxes next to each picture to represent the 10 "Hail Mary" beads of each decade. I covered the card stock with contact paper so we could use dry erase markers and reuse the page as often as we would like. I didn't make a box or marker for the "Our Father", "Glory Be" or the "Oh My Jesus" prayers but if I had a chance to do it over again, I certainly would because he wants to mark something for every prayer. Our current compromise is that he underlines the mystery picture to signify the recitation of the "Our Father" but does not currently mark the "Glory be" or "Oh My Jesus" prayers in anyway. 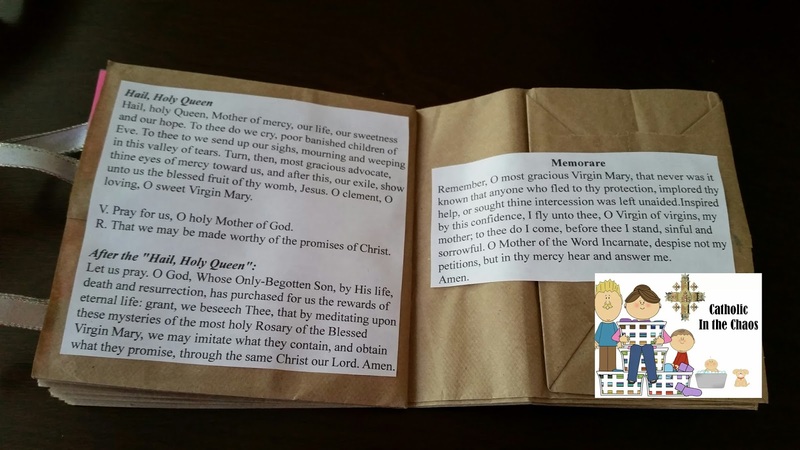 I quickly printed out copies of the other prayers and glued into the booklet so as Pickle gets older he can refer to them at any time. 1.) Place large pieces of paper on the floor numbered 1-10 and have your child jump in order up to 10 marking each "Hail Mary" as it is being said. Return to start and begin again for next decade. 2.) 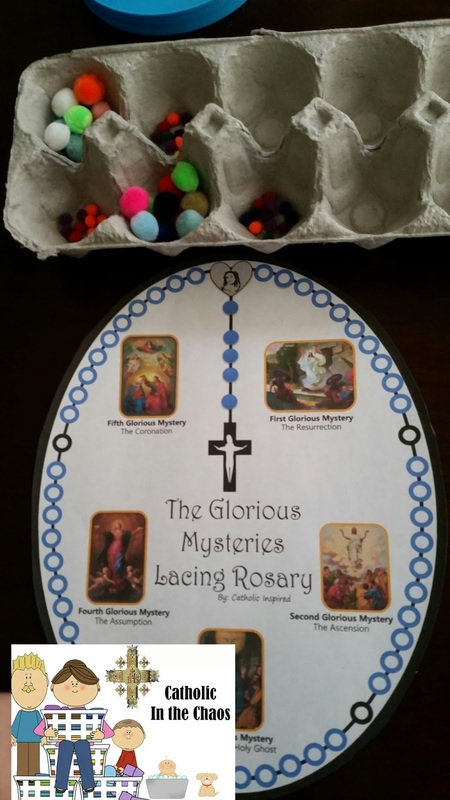 Place large pictures representing each mystery of the rosary around your house/yard. 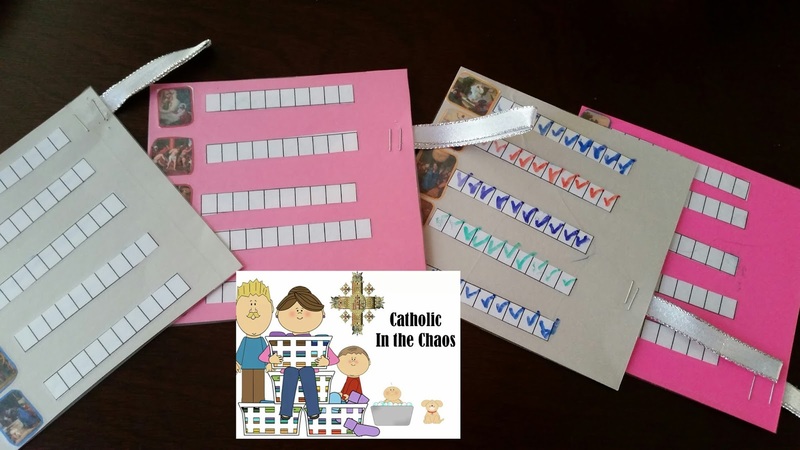 Put adequate space between each picture and have your child jump only when saying "Hail Mary", so that your child reaches the picture representation of the mystery by the 10th "Hail Mary". Praying in public is a very easy way to incorporate movement while praying which helps to keep Pickle engaged for the entire rosary. Pickle and I pray often while taking walks in our neighborhood or on nature trails with Little Bean in the stroller. It's a nice way to get some fresh air and enjoy God's beautiful creation while praying to our Holy Mother. Another thing Pickle really enjoys is to pray outside in front of statues of Mary. We have a grotto at our church of Our Lady of Guadalupe. Pickle asks to go visit "Mary" there and we have said several family rosaries there after mass or confession on beautiful days. 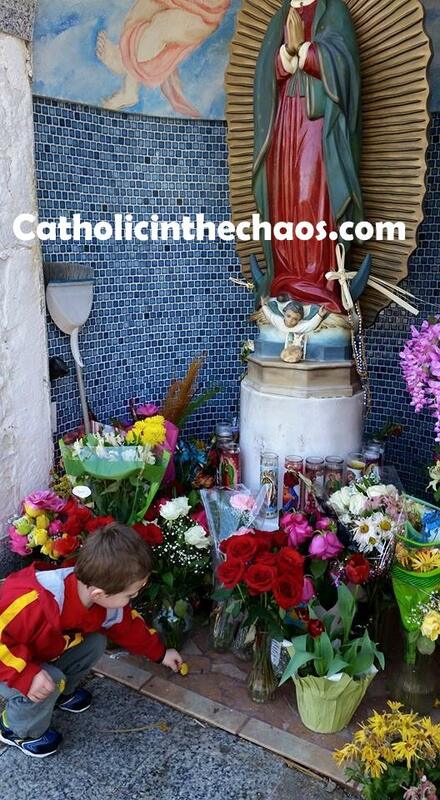 We have also said rosaries in front of statues at local shrines as well. My best tip when making trips to shrines with little ones is to be sure to pack enough food and drink for the trip. As long as Pickle is well fed and not thirsty, he very much enjoys visiting shrines and praying in public. So what is the BEST way to get my child/children to pray the rosary? My best advice would be to think about what your child/children enjoy or do best and use those strengths or interests to your advantage. 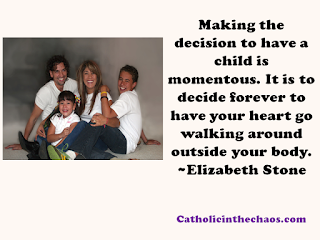 You can still teach your child the reverence of prayer, just without all the power struggles. Work smarter, not harder. At least that's what "they" say! Do you have any interesting ideas or ways you pray the rosary with your children? Please share your great ideas below. 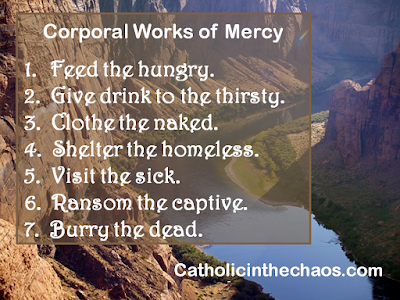 Catholic Tidbit: Works of Mercy! 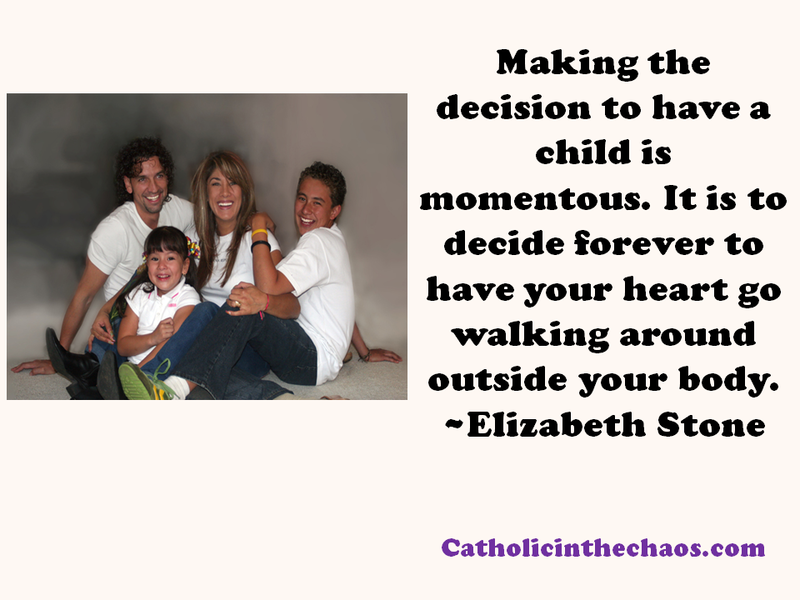 Here's a quick Catholic Tidbit! 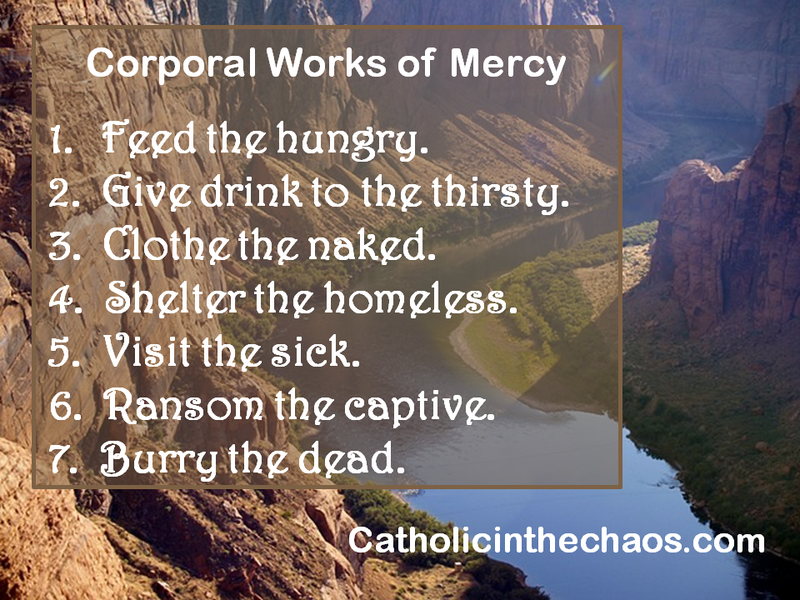 Remember way back when you were getting ready to be confirmed and you talked about the Corporal and Spiritual Works of Mercy? Are you scratching your head, trying to recall what they are? Well here's a little reminder.